Monthly. Edited by Robert Davis. Short-lived scarce trade journal. 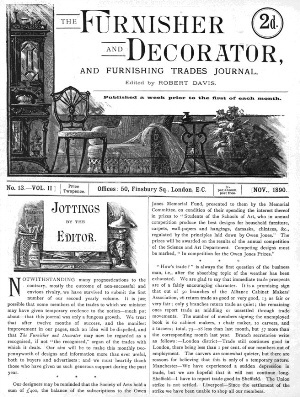 Despite the similarity of the title and content, this journal appears to have no connection with Furniture and Decoration. Arts: Search has digitized issues 13-24 (November 1890-October 1891). Only 3 more issues were published. We will digitize further issues if they can be traced.